In the new issue of Back Issue magazine (#75, shipping today), editor Michael Eury turns back the clock to the 1980s, to cover the top independent comics of that decade. Shown above are Richard and Wendy Pini, creators of Elfquest (which is spotlighted in this issue). The creative couple stopped by our booth at Comic-Con last month, and autographed a pre-release copy if issue #75, and it now has a happy home at Euryman’s secret comics cave. 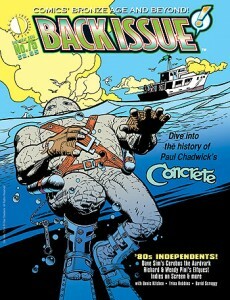 There’s also coverage of Cerebus, and a personal fave of mine, Concrete. Don’t miss it! This entry was posted in TNT on 19 August 2014 by Mr. Morrow.